Safeguarding client confidentiality and securely backing up your data are our highest priorities. Q-interactive™ upholds the highest industry best practices for data security and encryption. 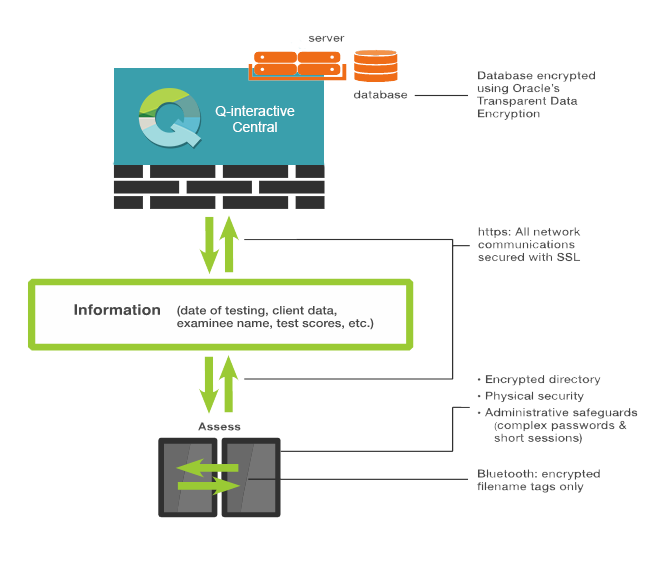 All client information and test data are encrypted and immediately backed up as they transfer between the Pearson Server, and Q-interactive’s digital devices. Pearson uses one Secure Domain Name service, owned solely by Pearson and is hosted in Toronto, Canada. When users access Q-interactive, they are logging into Pearson directly. Our server is behind a firewall and Secure Socket Layer (SSL), and also encrypted. Q-interactive also encrypts all users’ Personal Identifying Information (PII). No Pearson employee, besides the primary database administrator, can access user PII (such as passwords) or the records of their clients. This prevents misuse or loss of private data. Disaster recovery is handled by making an encrypted backup of our database, which is then stored in Vancouver, British Columbia –where only the primary database administrator can access the backup information. Click here to read more about our security and privacy principles.